Dr. Lawrence Feingold, in this excellent volume, offers a treatment of the Eucharist that not only is useful for the classroom but for anyone wishing to enter more deeply into the Paschal mystery and the Eucharist. 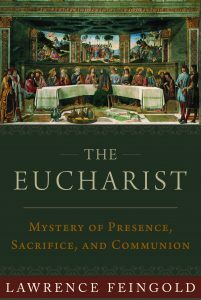 The subtitle reflects the outline of the book, as Feingold shows the three ends of the Eucharist: the presence of Christ with us His beloved, the sacrifice by which He offers Himself for us, and the communion into which He enters with us His beloved. These three fundamental ends of the Eucharist correspond to the three purposes for the Incarnation. Through the incarnation and Eucharist Christ extends the spousal love of the three Divine Persons in the Trinity thereby divinizing us by His share in our human nature and taking us into the very life of the Triune God. Through this marriage bond, we are incorporated into the body of Christ as the marriage between Christ the bride groom and his spouse the church.Thereby, the grace of baptism is brought to perfection as we are nourished through the Eucharist toward which all the other sacraments are oriented, and taken up into the Paschal mystery coming through the incarnation, bearing fruit that extends through all time and space in the Eucharist. Thus the Eucharist is the sacrament of love and charity, instituted to accomplish the spousal relationship of love, our sanctification, and divinization. Feingold shows that without a profound understanding of the mystery of the incarnation by which Christ became one of us, it is impossible to understand and believe in the Eucharist. Not only are we blessed to receive this precious gift of divinization by which Christ transforms us more deeply into the image and likeness of God into which we have been created, but the incarnation and Eucharist also show us our immense dignity through Christ’s taking on our humanity. He uses Sacred Scripture and ample citations from the fathers of the church, east and west, as well as later magisterial teaching. While focusing especially on Saint Augustine and Saint Thomas, Feingold draws upon the more contemporary theological works of Max Scheeben and the recent popes. Feingold especially integrates the teaching of Saint John Paul II on the spousal capacity in man elaborated in his theology of the body. This book also shows the fruit of the Eucharist in the deepening of the Holy Spirit who has been received in the sacraments of initiation; it also shows the relationship between Mary and the Eucharist, the connection between the old covenant with Israel and the new covenant in Christ, as well as the relationship with the marriage covenant; and upholds the way in which the deepest yearnings of man are even now tasted in the Eucharist, preparing us for full communion with Christ when He comes again. I especially appreciate his emphasis on Sacramental realism, particularly regarding the Eucharist. Accordingly, he emphasizes presence as real presence; conversion of the elements into the body and blood of Christ as being a substantial conversion; and the communion brought about in Christ as a real and not simply symbolic one. Also very much appreciated is the section on Eucharistic Adoration. Feingold’s treatment is thorough, very readable and very clear. It is at once scholarly and spiritual, and would be an excellent textbook at the undergraduate as well as graduate theology levels. It would also be superb for seminary instruction. As a seminary professor, I plan to incorporate its use. Fr. Thomas Acklin, OSB, Senior Fellow of the St. Paul Center, is a spiritual director and theologian who serves as Director of Counseling at St. Vincent Seminary in Latrobe, Pennsylvania. He is the author of several books, including Spiritual Direction: A Guide for Sharing the Father’s Love, with Fr. Boniface Hicks, OSB, and The Unchanging Heart of the Priesthood: A Faith Perspective on the Reality and Mystery of Priesthood in the Church.